-Supplies- E6000, Bead Boards, Flex Needles, Large Eye Needles etc. 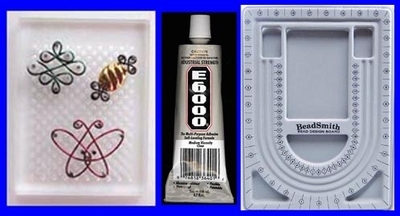 Home > **Tools** Books, Wire, Cord, Thread & Supplies > -Supplies- E6000, Bead Boards, Flex Needles, Large Eye Needles etc. E6000, Bead Boards, Flex Needles, Large Eye Needles etc. Fills gaps, bonds anything, even oily surfaces. Cures in 20 seconds. Ideal for gluing memory wire endcaps. 1/2 oz.tube. Stiff yet flexible. Size 12 is the thinnest gauge. Great for use with seed beads. 2.5" long twisted wire needles, each with a collapsible eye. Makes working with seed beads a breeze! 10 per package. Two needles soldered together forming a very big eye -- "If you have been dreading threading, fret no more!" Create a comfortable work space on any table or tray and prevent beads from rolloing away. Super-soft, foam like material is ideal when working with small beads. Large 11x14inch size maximizes your work area. Includes 3 washable bead mats. Wigjig Olympus is a 5� x 5� clear acrylic wire form jig with 482 holes and 40 removable pegs. Simply lay the Wigjig Olympus on top of anything - a picture in a coloring book, on a piece of fabric or wall paper design, or even a photograph. Set the pegs in place to create endless possibilities. Includes basic instructions and designs. Wigjig Olympus-Lite is the newest addition to the Wigjig family! This less expensive version of the Olympus has a smaller work area but the same size pegs and spacing as the Olympus. Also, the Olympus-Lite has been specifically designed for beginners, and comes packaged with 10 metal pegs, plus a complete set of instructions with photos showing how to make a pair of Celtic Earrings. Each pack contains 2 4.5"x5.5" pcs. A terrific help when designing necklaces, especially when it comes to figuring out the finished length! This grey flocked bead design board has grooves for three strands and recessed wells for beads, needles and tools.